Hampi was once the glorious capital of mighty Vijayanagara Empire (1336-1565), from the Deccan Plateau to the tip of the Peninsula. Founded in the middle of the 14th century by two local princes, Hukka & Bukka, the Vijayanagara Empire came to be celebrated for its might and wealth and as a showpiece of imperial magnificence. The emperors of this dynasty were great patrons of art and architecture, which can still be seen in the vast ruins of Hampi. In an effort to resurrect this abandoned capital, the government has been involved in the restoration, excavation and protection of the ruins, which spread over an area of 26 sq. km. Rocky hills and the mighty Tungabhadra River, which flows through this rugged landscape, dominate the terrain. Location: Hampi is located in the central part of the state of Karnataka, in the southern part of India. It is 353 km from Bangalore, and 13 km from Hospet. It is located on top of a rugged terrain and is 467 m above sea level. Tungabhadra River flows through Hampi. It has a tropical climate with hot summers (April-June), and cool winters (October-February). It experiences the southwestern monsoon rains from June to August. 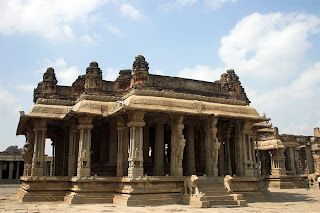 Importance: Ruins of Vijayanagar capital and its ancient temples. This dam is 17 Km from Hampi. 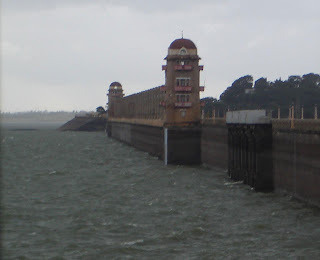 The site of the dam built across the Tungabhadra river lies 15 Km from Hospet. The high masonry dam is about 590m Long and 49 m. high. The reservoir has a storage capacity of 132,559 million cubic feet of water spread over an area of 379 sq. km. The Queen's Bath looks rather block-like from the outside. Inside, however, gallery-verandas, with overhanging Rajasthani balconies, encircle a 15-metre square bath. Once, cool, perfumed water poured in a minor waterfall at one side and flowed out through an underground drain. The bath, though carefully shielded on all sides, was open to the sky. It was a celebration of the good life, which, in many ways, was the leitmotif of Hampi. Near the Hazara Ram Temple, in the walled area of zenana (women's quarters), there is an exquisite pavilion called the Lotus Palace. It is believed that the women of the royal family who lived in the nearby Queens' Palace disported themselves in the water pavilion within their protected enclosure and met in the Lotus Palace. Its inflicted arches are particularly intriguing. This palace is a blend of Indo-Islamic architecture and gets its name from the lotus bud carved on its domed and vaulted ceiling. The Mughal monuments in Agra, built a century later, show modified variations of such features. It was built when Krishnadeva Raja came back from his victorious expedition against the King of Orissa. The spaces between the rows of the plinth-moldings here are most elaborately and elegantly carved. The kings of Vijayanagar used to sit on a grand throne in the House of Victory and witness the nine-day Dasahara festival. Westwards from the House of Victory, leading through two ruined gates, the path leads to the Hazara Ramaswami temple. This temple is believed to have been the private place of worship of the royal family. The chief attraction of the temple is the series of scenes from the Ramayana carved on two of the inside walls of the mantapa. 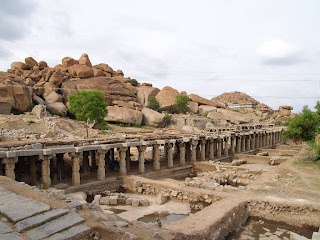 The genesis of the place known today as Hampi dates back to the age of the Hindu epic Ramayana when it was the site of Kishkinda, a monkey kingdom. 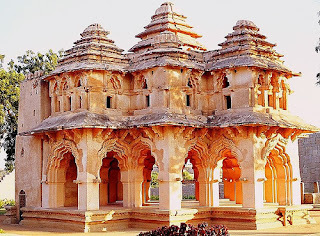 The most splendid monument of Hampi is undoubtedly the Vithala Temple Complex with its 56 musical pillars. To the east of the hall is the famous Stone Chariot with stone wheels that actually revolve. In front of the shrine stands the great mantapa. Resting on a richly sculpted basement, huge pillars of granite support its roof, about 15 feet in height, each consisting of a central pillar surrounded by detached shafts, all cut from one single block of stone. Several of the carved pillars were attacked with such fury that they are hardly more than shapeless blocks of stones and a large portion of the central part has been destroyed utterly.